If you're carrying Barrel™ Chairs in stock and you're in the event industry, then you need at least one of these fantastic Nufurn Barrel™ Chair Trolleys. Designed in Australia specifically for our Barrel™ Chairs, this trolley will significantly cut down on your set up and pack up times as well as improving work efficiency around your warehouse. 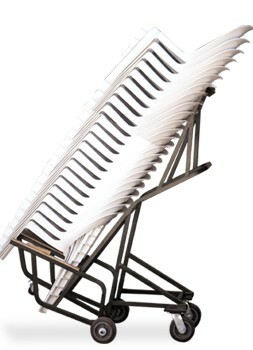 A great addition to help your staff move large quantities of Barrel™ Chairs, safely, quickly and with minimal effort. Call today to order this back saving product!!! 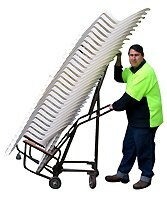 Safely moves 20-25 stacked chairs at a time. • Commercial grade powdercoated steel for durability. moving chairs and save your back! • Heavy duty wheels for all day use. Don't let your staff injure themselves trying to manually move stacking chairs.. The Nufurn Barrel™ Chair Trolley. Simple to load and move 30 Barrel chairs at one time. The Deluxe Barrel™ Chair trolley is ultra safe, ultra strong and is vital to any event company that wants to improve working efficiency while looking after staff OH&S concerns.